Katharine the Shark, the Great White tagged last August in Cape Cod, surfaced today off of Boynton Beach. Her followers at Ocearch received her radio ping today at 12:18 PM. But there is something that the Ocearch researchers don’t know. Katharine may have been looking up an old friend of hers in Boynton. graduating class in 1880. One of her classmates and lifelong friends was Cora Stickney Harper. Cora married Charles T. Harper in 1901, and the couple lived in Boynton from 1901 to 1912. 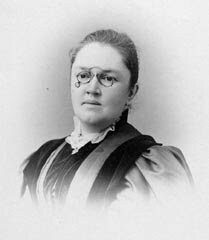 The Wellesley College archive has correspondence between the two classmates and friends, and when Cora died suddenly in 1914, Cora’s husband wrote to Katharine Lee Bates at Wellesley. Among Cora’s accomplishments were the founding of the Boynton Woman’s Club and a Daughter of the American Revolution Chapter in Fort Pierce, which yesterday celebrated its 100th anniversary. So maybe the shark named Katharine wanted to look up the beautiful area where her namesake’s friend once lived.